Up until recently, whether you knew it or not, banner advertising was really only effective at increasing your brand awareness. In fact, if you've used banner advertising before, you probably know that the click-rates on them are horribly low... and sign-ups? Forget about it. 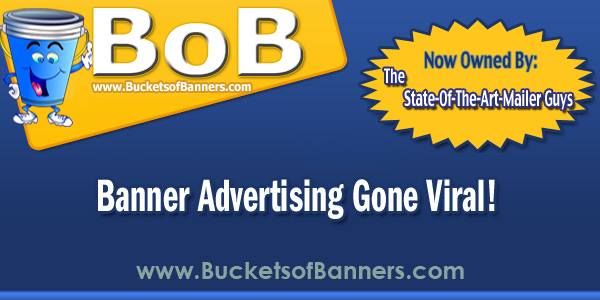 The SOTAM and vTrafficRush guys plan to change that with the new BucketsofBanners (BoB) that is rolling out in 3 phases. They started with the Interactive Splash Page! Earn Banner Impressions - Earn 3 banner impressions every time your ISP is shown. Personal Branding - Your name and image is located on the top left corner. Brand Piggybacking - Capitalize on the branding of other members randomly promoted on your ISP. No Credits Needed - You do not need credits assigned to your banners to have them seen on other members' ISPs. Exclusive Branding Placement - Club BoB members get preferred banner placement highlighting their Club BoB membership. 2X More Banner Views - Club BoB banners randomly rotate in the 2nd and 3rd spots on every ISP getting shown twice as much as BoB member banners. Interactive Splash Page "Click" Bonus - Prospects that join can gain a bonus up to 500 sign up credits from clicking on a Club BoB banner before signing up which gains you passive clicks from other members who are promoting their ISP. Deleted Member Default - If a member has deleted their account and is still promoting their ISP, the ISP of a random Club BoB member will be shown. 3 Program Promotion Bonus - Add your ids in the downline builder and gain additional sign ups at ViralAdBuilder, State-Of-The-Art-Mailer and vTrafficRush. Default 3 Program Bonus - If you do not have your VAB, SOTAM or VTR links entered in the downline builder, your sponsor's ID's will be shown. If neither you nor your sponsor have ID's entered, it will default to a random Club BoB member link. Viral elements were added that get your banners shown... even when you aren't promoting! There is also a sign-up bonus infused in the banner of Club BoB members that encourage people to click on their banners... even when it's not them promoting! This is the first of their 3 phase rollout and you are able to lock-in at the old prices now. This is just the beginning so get in now because when they are done with this.... look out!